Sales Motivation Video: Who Are Your MASTERMIND Peers? I love this quote by Jim Rohn. By no means is it his most famous quote, but I feel it’s his most life-changing. Who is in your crowd? I’m a big believer of having peers with whom you can connect regularly in some form of a mastermind group. The ability to learn and share with others is huge. Name one successful person and they will say they didn’t get to their level of success without the help of someone else. If you don’t have peers who can challenge and push you, it’s adamant you make it your objective to find them. If you do have peers with whom you associate, are you holding each other accountable and challenging each other enough? Are you providing them insight and collectively developing better outcomes? Personally I have several peer groups I connect with on a regular basis. I’m a big fan of the model. One of my peer/mastermind groups is made up of 3 others from whom I gather a huge amount of insight and I would hope they would say the same about me. I would state very strongly that my peer groups have allowed me to succeed far faster than I ever would have otherwise. Rarely does a week go by when I’m not talking one on one with a member of my peer group. Rarely does a day go by I don’t trade emails with one or more of them. Rarely does a day go by I don’t find myself processing a decision based on input from the group. I count my peer groups as critical assets in my personal and professional life. Let me introduce you to my main peer/mastermind group. 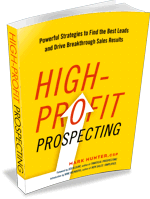 It’s comprised of 3 other sales experts: Jeb Blount, Mike Weinberg and Anthony Iannarino. I suspect you recognize their names from the best-selling books each one has written, a conference you attended or from following them on-line. I’ll be blunt — we are brutal with each other and, at the same time, we respect each other and would do anything to assist each other. What makes this group special is we rarely meet in person! Each one of us has a brutal crazy travel schedule and we live in different parts of the country. Despite how crazy it may seem, we know each other incredibly well, both professionally and personally. It’s amazing how the four of us collaborate and share, despite what some might see as us being a competitor of one another. We don’t see it that way. We see a world of unlimited opportunities just waiting for us. To give you a quick sense of what we’ve done as a group, a couple of months ago we met in Philadelphia with Gerhard Gschwandtner of Selling Power Magazine for a series of video interviews. You can find those at this link. The last couple of years we’ve done on-line video webinars attended by thousands. In fact, we have one coming up shortly: Virtual Sales Kickoff on Feb. 16. Be sure to register at this link! Even if you can’t make it live, you’ll get access to the video after the event. The four of us are also collaborating on several other big ideas you’ll be hearing about in 2017. All of this is on top of the way we support each other each time one has a new book coming out. I admit we’ve taken the concept of a mastermind group to an entirely new level. The reason I’m sharing this with you is I want you to see what is possible when you connect with peers. The greatest privilege you’ll ever have is helping someone else achieve their goals, and for me it starts with my peer/mastermind groups. Click on the below image or this link to sign up for the Virtual Sales Kickoff: Yes! I Want Great Insights for 2017! Make this an event you rally your peers/mastermind group behind too!